Your residential search resulted in 8 properties found. An exceptional 5 bedroom detached house with 3 reception rooms, beautiful open plan dining-kitchen with sitting area, 3 bath/shower rooms, detached double garage and ample parking. Occupying a larger than average plot with private aspects and enjoying a cul-de-sac location on this much sought after development. Only on viewing can one appreciate this delightful and spacious house, plot and the immediate location. Conveniently placed within a short walk of Whittaker Moss Primary School, shops, restaurants and with beautiful countryside on the door step. The accommodation comprises: imposing HALL with spindled staircase and cupboard; CLOAKROOM with modern WC and washbasin; STUDY with good range of modern fitted furniture; spacious LOUNGE with substantial Limestone and Travertine fireplace incorporating open coal effect living flame gas fire; DINING ROOM with double doors from lounge and door to kitchen plus double French doors to patio; SITTING AREA, open plan to kitchen, with view over garden and French door to patio and with built-in cupboard; DINING-KITCHEN with beautiful modern (2017) fitted kitchen by Rossendale Interiors with painted wood Shaker style doors, Silestone quartz worktops and integral Bosch appliances comprising double electric oven, microwave, 5-ring gas hob, extractor hood, fridge, freezer and dishwasher plus wine cooler; UTILITY ROOM with fitted units, space for washing machine and dryer and door to drive. To the FIRST FLOOR, there is a spacious and imposing LANDING with spindled balustrade and cylinder/airing cupboard; generous sized MASTER BEDROOM with good range of modern fitted furniture; EN SUITE BATHROOM with modern suite comprising bath, shower cubicle with plumbed shower, WC and washbasin; BEDROOM 2 with fitted wardrobes and EN SUITE comprising shower cubicle with plumbed shower, WC and washbasin; BEDROOM 3 with modern fitted furniture and access to Jack & Jill bathroom; BEDROOM 4 originally a double bedroom but now used as a dressing room with modern fitted furniture; BEDROOM 5 with trap door to loft; BATHROOM with access to both landing and bedroom 3 comprising modern bath, shower cubicle with plumbed-in shower, WC and washbasin. EXTERNALLY, there is a good sized double-width drive leading to a brick built DOUBLE GARAGE with remote controlled door, power and lighting. Built in 2000; Freehold; Council Tax band G; Gas central heating (regular boiler with hot water cylinder); uPVC double glazed. Occupying a generous plot with open and private aspects, a 1930's character property, individually designed and built and offering spacious accommodation with 3 reception rooms and 4-5 bedrooms. 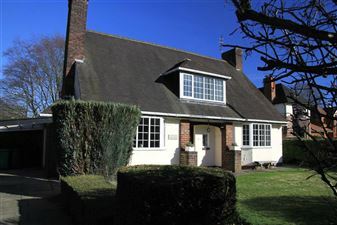 The recently converted garage now comprises a cinema/family room and having an adjacent WC plus side entrance and boiler room, there is excellent scope to create a SELF-CONTAINED ANNEXE. Many original features remain such as the servants' call box, inglenook fireplace and wood panelled staircase. Extremely convenient for Hopwood Hall College, Cardinal Langley Secondary School, primary schools, motorway access and buses for Manchester etc. The accommodation comprises, on the GROUND FLOOR: OPEN PORCH; HALL with original feature wood panelled staircase with large walk-in cloaks/storage room below with washbasin; LOUNGE with imposing inglenook fireplace having cast iron fireplace with open coal effect living flame gas fire, bow window to front and opening to the CONSERVATORY which enjoys a superb aspect over the garden and also opens onto decking; DINING ROOM with bay to front and Victorian style fireplace with open coal effect living flame gas fire and opening to the beautifully appointed BREAKFAST-KITCHEN which overlooks the garden and has French doors to the decking and has bespoke fittings with mixed granite and solid wood worktops including the breakfast island unit, range style cooker comprising 6-ring gas hob, double gas oven and grill, integral dishwasher and Belfast sink; PANTRY/UTILITY ROOM with plumbing for washing machine; SIDE ENTRANCE LOBBY with access to the BOILER ROOM with hot water cylinder, separate WC and door to the newly refurbished and spacious CINEMA/FAMILY ROOM (original garage door in situ). To the FIRST FLOOR, the imposing wood panelled staircase has the original stained glass leaded window; MASTER BEDROOM with windows to front and rear and with modern fitted wardrobes; BATHROOM with attractive suite comprising feature bath, large tiled shower cubicle with plumbed-in shower plus pedestal washbasin; 2ND DOUBLE BEDROOM with view over the garden and door to DRESSING ROOM/STUDY; 3RD DOUBLE BEDROOM which has an understairs wardrobe and an EN SUITE WET ROOM comprising open shower, WC and washbasin and a door to the upstairs LOUNGE/GAMES ROOM which has 5 skylights (access from this room also to dressing room of Bedroom 2). From the landing is a staircase to the ATTIC ACCOMMODATION comprising 4TH BEDROOM with space for twin beds and access to eaves storage; beautiful SHOWER ROOM with skylight and large glazed shower, bath, WC and washbasin. Long leasehold subject to ground rent of ?10 pa; Rear section of garden has been on garden tenancy for many years (current ground rent ?193.30 pa 2018/19 - owner has 1st refusal to buy); Council Tax Band F; PAST PLANNING PERMISSION (expired June 2018) for extending along the back of the house, incorporating utility, 6 x 7m kitchen-diner, study and music room; Gas central heating with hot water cylinder; Double glazed (excluding original leaded windows). AN INDIVIDUALLY DESIGNED AND BUILT EXECUTIVE DETACHED OFFERING BEAUTIFULLY APPOINTED AND SPACIOUS ACCOMMODATION. Enjoying a good sized plot with open aspect, ample parking and detached garage, the property was built in 2003 with high quality fittings throughout. Viewing is absolutely essential to fully appreciate this stunning property and its immediate location. Conveniently placed within easy walking distance of a number of popular primary schools, shops, restaurant and buses for Bury, Rochdale and Manchester. The accommodation comprises: a spacious HALL with ample room for furniture and feature spindled staircase with cupboard below; CLOAKROOM with modern WC & washbasin, tiled floor & part tiled walls and ladder towel radiator; LOUNGE WITH DINING AREA having bay window to front, double French doors to rear and inglenook fireplace (flue blocked-off at present) with windows to either side; FAMILY DINING-KITCHEN WITH SITTING AREA having beautifully fitted Shaker style kitchen with granite worktops, integral Bosch electric double oven, microwave and 5-ring gas hob plus extractor hood, dishwasher, tiled floor, part tiled walls and under floor heating; UTILITY ROOM with units & worktops to match kitchen, under floor heating to tiled floor and door to back garden. To the FIRST FLOOR: good sized GALLERY LANDING with space for furniture, spindled balustrade, fitted book shelves, cylinder/airing cupboard and trap door with fold-down wooden ladders to the large LOFT which has carefully planned trusses allowing for ample storage or for conversion to room in the roof accommodation if desired; MASTER BEDROOM with a good range of fitted furniture; spacious EN SUITE comprising large shower cubicle with plumbed-in shower, Duravit WC, Villeroy & Boch washbasin to vanity unit, part tiled walls and tiled floor; 2 further DOUBLE BEDROOMS and a large SINGLE/TWIN BEDROOM currently fitted out as a dressing room with a good range of fitted furniture including dressing table/desk; FAMILY BATHROOM with attractive Villeroy & Boch suite comprising bath with plumbed shower above, WC, washbasin to vanity unit, fully tiled walls and tiled floor. Beyond the good sized drive is a detached brick built single garage with power, light & water. Attractive gardens extending to front, side and rear with the grassed common land being left unfenced to take advantage of the superb open aspect. Understood to be freehold; Built in 2003; Council Tax Band F; Gas central heating with Megaflo pressurised hot water cylinder (no radiator to bathroom); uPVC double glazing.